If you're on Firefox, Safari or Edge, you can see other people's screen shares. But you can't screen share yourself. Use Chrome to share yourself. Click Share in the bottom left of your screen. 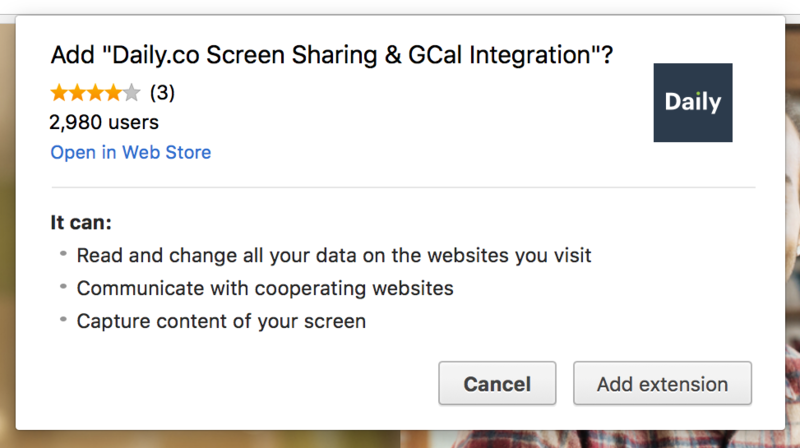 The first time you screen share, you'll be asked to install the Chrome extension. It's fast. Click Add Extension in the popup. Tip: if you'd like to prep before a call, visit the Chrome Web Store, to get the extension. Great! A popup appears. 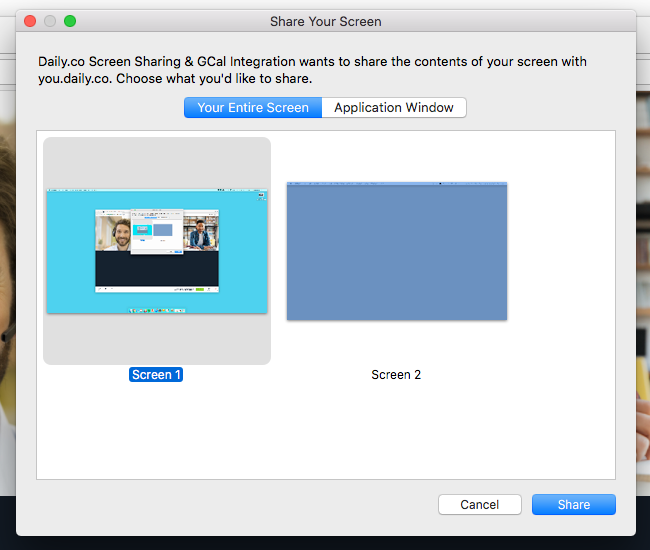 Select if you want to share your Entire Screen or a specific Application Window. Troubleshoot: If you still can't share, refresh Chrome. Tip: if you have multiple monitors, entire desktop lets you pick which screen. Tip: To share a slide deck (i.e. PowerPoint or Keynote) presentation, be sure you share your entire desktop. The Stop button in the lower left. The Stop sharing button in the top right. The blue Stop sharing button in the popup the Chrome browser creates. Tip: The Chrome popup can be repositioned anywhere on your screen — giving you quick access to end your screen share. Can we help? Email help@daily.co anytime. Chat with us M–F, 9am–5pm PST.